Sleep apnea is a disorder in which breathing is interrupted periodically throughout the night. These pauses in breathing may be accompanied by choking or gasping but rarely awaken the sleeping individual. An estimated 18 million Americans suffer from sleep apnea, many of them unaware of their condition. There are two main types of sleep apnea: obstructive and central. Obstructive sleep apnea occurs when the throat muscles relax and droop during sleep, blocking the airway and causing breathing difficulty. It is by far the most common form of the disorder. Central sleep apnea is the result of the brain failing to properly control breathing during sleep; this is rare. The main sign of sleep apnea is chronic, loud snoring. Symptoms include daytime drowsiness, lack of concentration, memory loss, irritability and depression. You may experience frequent morning headaches and sore throats and wake up with a dry mouth. Those who are male, overweight and older than the age of 40 are most at risk, though sleep apnea can – and does – affect people of both sexes and all ages. Other factors that can contribute to sleep apnea include natural aging, excessive or bulky throat tissue, large soft palate or uvula, small jaw, large neck and oversized tonsils or adenoids. Allergies, sinus infections, tobacco use and alcohol all may play a role as well. Sleep apnea is more than just a nuisance that robs you of sleep. Left untreated, it can lead to serious health issues such as congestive heart failure, stroke, heart attack, high blood pressure and cardiac arrhythmia. If you suspect you are suffering from sleep apnea, schedule a visit with your physician who will perform a thorough physical examination and may set up a sleep study test. You may be able to reduce the severity of your symptoms by implementing certain lifestyle changes. Try losing weight, cutting back or eliminating alcohol (especially before bedtime) and quitting smoking. Sleeping on your side instead of your back and elevating your head may also help. 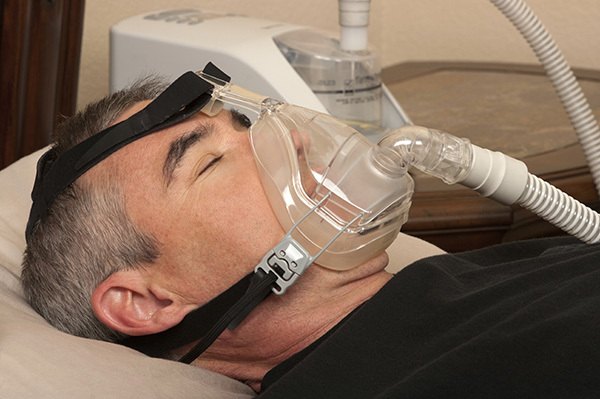 The preferred method of treatment for sleep apnea is continuous positive airway pressure (CPAP). This involves controlled bursts of air pumped into your throat while you sleep, delivered through a mask that is worn over the nose and mouth and attached to a machine. Other options for treatment include oral mouth guards that reposition the lower jaw and tongue, nasal breathing strips and surgery.